At the Carlyle Family compound, James and Bethany, who are monitoring Forever's vital signs, receive an alarm signal. They quickly realize that she's been attacked. Jonah and Johanna monitor progress as their Carlyle soldiers land and prepare to finish Forever off. But Eve's healing capacity is greater than the soldiers expect. As they line up to execute her, she escapes, and between her and the Morray Lazarus Joacquim, they dispatch all the Carlyle troopers except the chopper pilot. Eve gives Joacquim her bike, since his car was destroyed, and they part ways. She takes the chopper back to Jonah and Johanna's place. Back there, Johanna orders their servant Mason to hit her repeatedly, to make it look like Jonah attacked her. Then she orders Jonah to flee. When Eve arrives, Johanna claims that Jonah was acting alone in betraying Eve, and that when Johannah found out about it, he beat her and fled. Forever sends Johanna to the Puget Sound HQ of the Family, and reports everything to Malcom, their father. She then heads back to the compound in California for a checkup with Bethany and James. When she gets to her room, there is an e-mail waiting from an unknown sender, saying that Malcolm is not her father, and the Carlyles are not her family. 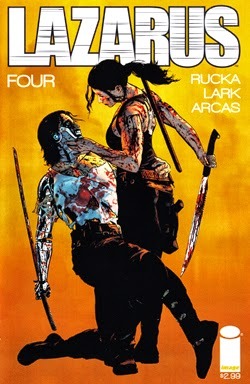 This is another outstanding installment of Greg Rucka's new dystopian-future sci-fi series. Forever Carlyle is an excellent character -- strong and powerful, clearly "badass" when she needs to be, but she also has a soft side, and an intellectual one. When Johanna pretends to have been beaten by Jonah, Eve immediately embraces and comforts her, swearing to protect Jo from their brother. Her clipped, factual report to their father shows that this young woman is a professional, and knows what she is doing. 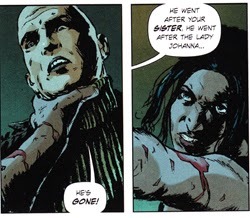 There are so many different facets to Eve's personality that it's clear Rucka could spend years showing them all to us. And that's just fine with me, because as long as this series continues to be produced at such a high level, I am along for the ride. Rucka shows off his storytelling prowess in this issue by using some very difficult narrative techniques -- techniques that would get a lesser writer into trouble and confuse the reader. He cuts rapidly among three concurrent scenes -- the Sierra Nevada compound with Beth and James, the L.A. manor with Johanna and Jonah, and the desert battle with Eve and Joacquim. Often he cuts from scene to scene in adjacent panels. But the story-telling is as sleek as a bullet, and there's never any reason to be confused. We know exactly what is going on in each scene, and the transitions enhance the pace of all three stories. Rucka doesn't show us everything in all three scenes -- he doesn't have to. He shows us enough, and we can fill in the rest. He's also smart enough to know when he can let the artist convey the emotion with a silent look between characters, without the need for words. Michael Lark's art continues to be a perfect complement to the story -- moody and heavily shadowed, it conveys the setting's grim darkness. But perhaps what I like most about the artwork is the fact that in this entire issue, there aren't any splash pages. That's right. Not. A. Single. One. Now, it's not as though I have anything against a full or double-page spread. When used appropriately, they can be some of my favorite scenes in a comic. But coming off of issues like JLA 23's final Trinity War chapter, which was nearly 33% splash pages and had almost no actual story in it, I find it refreshing that Lark knows when and where to use panels of different sizes. He makes the right choices, giving us wide angles when necessary, narrow close-ups when appropriate. 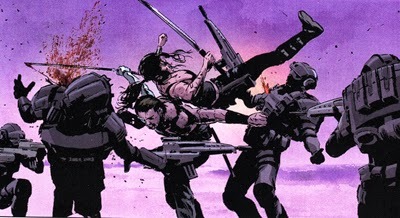 We zoom in on Eve's face as she holds Mason up to be strangled, but we get a nice wide shot of her acrobatic flipping over Joacquim to provide a spinning kick to the Carlyle soldiers who have betrayed her. Every panel is just the right size to do the job -- no bigger. The most significant consequence of Lark's wise and careful use of appropriately sized layout panels, and how sparing he is with even half-paged sized frames, is that when they do come, say in a later issue, they will have their full punch, because they have not been over-used. We know, when Lark and Rucka give us a full-page spread, or a double, it's only going to be for something crucial, for a story element that demands such elevated treatment. Normally when I comment about a book, I must confess I focus more on story and pencils/inks than I do on aspects like coloring. But I would be remiss if I did not mention the colorist of this issue,, Santi Arcas. One of the reasons the heavy intercutting of scenes works so well in this issue is that Arcas cleverly provides us with a different color palette for each scene. The Beth/James scene is done in reds and oranges. The Johanna-Jonah scene is done in blues and greens. The Eve-Joacquim scene is done in browns and purples. You can instantly tell just based on the color which characters are in the scene -- before you look at faces or bodies, or read a word of script. This is done incredibly well, so that you don't consciously notice it as you are reading the story (at least I didn't) -- it works on a subconscious level. And that is my overall impression of both this issue and the entire first story arc of the series. Rucka, Lark, and Arcas clearly understand the value of subtlety. Rather than beat us over the head with giant splash pages, obvious and contrived speeches, and panels designed to shock -- as so many modern comics seem to do -- the Lazarus team works with a solid, intellectual story that comes across due to a thousand tiny things they do on each page. If you want to be beaten over the head with an obvious story, then this series is not for you. Go read Forever Evil or Age of Ultron instead. But if you like a solid story in which the characters are well drawn, and their interactions drive the plot (instead of the plot driving them), the way good fiction is supposed to be, then you might want to give Lazarus a try. This series is only four issues old, and it's already shot to the very top of my pull list, sharing a place with the likes of the new Astro City, and the work of Gail Simone. And that's some pretty rarified air, up there.